We are all fully aware of the fact that there is no such thing as a 100% safe environment. Nonetheless, homeowners should always factor in a long list of threats that could easily disrupt their normal balance and put their safety, comfort and even their lives on the line. If you see it on the news, it means that it can happen to you too: burglary attempts and devastating home fires are a part of the world that we live in. Moreover, there is another major risk factor that we should take into consideration: cannabis fires. You might be wondering: why are cannabis fires so dangerous and how could I possibly protect my loved ones and my assets in the event of such an emergency? You can definitely improve home safety by installing a top security system, designed to ensure complete fire prevention and burglary protection 24/7. Now you can choose from different types of home security systems, with a plenitude of standard and optional features in your price range. 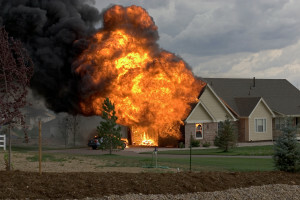 A system with fully functional smoke detectors will keep you out of harm’s way in the long term and help you respond to real emergencies involving home fires in record time. Fires that start on illegal cannabis factories usually generate tremendous losses and lead to an alarming number of fatalities and severe injuries. Moreover, these unpleasant events require the presence of at least 20 firefighters and special equipment. Cannabis fires are difficult to put out, especially taking into consideration that irresponsible growers always set up traps for law enforcement representatives, using barbed wire, electrified window bars and door handles and so on. Furthermore, cannabis fires are a very common threat because the people who work in improvised, illegal factories rely on dangerously wired heating and lighting systems to perform their daily tasks. “The organized crime gangs behind the trade in home-grown cannabis are reacting to police crackdowns by moving away from large-scale premises to employing a large number of “gardeners” to operate small-scale “grow sites” or factories across several residential areas,” indicates Alan Tavis in his article published in the . Apparently, illegal cannabis production represents a lucrative field that convinces a large pool of criminals to polish their “gardening” skills in order to supplement their income. You can minimize risks by investing in the simplest, cheapest DIY security system with smoke detectors. Also, if you want to play detective, you should know that there are a few common signs indicating the presence of a cannabis farm in your neighborhood. Permanently covered windows, a sweet, intoxicating smell, a powerful lighting system used day and night by your neighbors, unusual condensation and heat, lots of cables, a plenitude of growing materials and the presence of a large number of suspicious guests are elements that usually point in the same direction, indicating that you live in the proximity of a cannabis factory. In this case, you only have one valid option at hand: refuse to take any chances and protect your home in a highly effective manner by purchasing and installing the best security system.